Hello, I am back in the Philippines after a wonderful long weekend in Hong Kong. I did manage to get to the Mong Kok stamp arcade but did not buy any stamps this time. Nothing new to show you from that visit. So, since I was showing space related stamps in my last post I thought I would continue with the them and show the above because today marks another space anniversary. 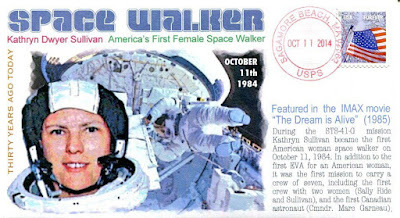 One I think worthy of mention, and, while I do know if she was recognised on a stamp there is this cover to commemorate the space walk. She performed the first extra vehicular activity (more popularly known as an EVA) by an American woman during the Space Shuttle Challenger mission STS-41-GON on October 11th 1984. She and mission specialist David Leestma carried out a 3½ hour space walk in which they operated a system designed to show that a satellite could be refueled in orbit. 3½ hours, that is what it took me to pack orders received through cddstamps online store while I was away. Thanks to my customers and if you have a few gaps in your collection perhaps you will enjoy looking through cddstamps stock. Still over 23,500 items and more to be loaded now!